pO2 in the kidney is maintained at relatively stable levels by a unique and complex functional interplay between renal blood flow, GFR, O2 consumption, and arteriovenous O2 shunting. The fragility of this interplay makes the kidney susceptible to hypoxic injury. Cells in the kidney utilize various molecular pathways that allow them to respond and adapt to changes in renal oxygenation. This review provides an integrative perspective on the role of molecular hypoxia responses in normal kidney physiology and pathophysiology, and discusses their therapeutic potential for the treatment of renal diseases. Because the kidney carries out its complex transport functions within a relatively narrow range of pO2, which is very low in the medulla, susceptibility to hypoxic injury is high. Renal cells have therefore evolved a variety of molecular mechanisms that allow them to respond and adapt to decreases in renal oxygenation. These mechanisms operate during development, under physiologic and under pathologic conditions, and have wide-ranging implications for the pathogenesis and treatment of renal diseases. Although several transcription factors are involved in control of hypoxia and oxidative stress responses, there has been much interest, from both the basic scientist and the clinician, in the hypoxia-inducible factor (HIF) pathway. This is because of its central role in cellular adaptation to hypoxia and its great potential for therapeutic exploitation in the areas of anemia treatment, cytoprotection, cancer, and wound healing. Here, I provide a focused perspective on key mechanisms that regulate and integrate this pathway with other hypoxia responses in the kidney and discuss its potential for renoprotection. Overview of renal hypoxia mechanisms and selected 2OG oxygenase-regulated processes that affect renal physiology and pathophysiology. Renal oxygenation is regulated by arterial oxygen content, arteriovenous O2 shunting, and O2 consumption (V̇o2). Kidney injury results in structural and functional changes that negatively affect renal oxygenation. The 2OG-dependent oxygenases, which require molecular O2, 2OG, and ferrous iron for the hydroxylation of substrates, are inhibited under hypoxia. In addition to hypoxia, 2OG oxygenases are inhibited by structural 2OG analogs, ROS, NO, Krebs cycle metabolites succinate and fumarate, cobalt chloride and iron chelators such as desferrioxamine irrespective of O2 levels. HIF 2OG oxygenases either hydroxylate-specific proline residues located within the HIF-α oxygen-dependent degradation domain (PHD1, PHD2, and PHD3) or an asparagine within the C-terminal transactivation domain (FIH). Although oxygen-dependent, the catalytic activity of HIF hydroxylases is also modulated by multiple signaling molecules, such as reactive oxygen species (ROS) and nitric oxide (NO) (Figure 1), linking various intracellular signaling pathways, which include signaling through angiotensin II receptors or NO synthase, to renal O2 sensing.4,13 This has significant implications for CKD associated with diabetic nephropathy, the aging kidney, inflammatory renal diseases, and others. Additional insights into the complexity of molecular O2 sensing regulation and how it interplays with energy metabolism and other oxidative stress sensors comes from the study of inherited renal tumor syndromes. Mutations in the Krebs cycle enzyme fumarate hydratase occur in hereditary leiomyomatosis and renal cell cancer syndrome, a rare form of familial renal cancer, and lead to the accumulation of fumarate. Fumarate competitively inhibits 2OG oxygenases as well as the degradation of NF (erythroid-derived 2)-like 2 (NRF2), a transcription factor that regulates cellular antioxidant responses.14 Although this is an active area of investigation in renal oncology, little is known about how links between O2 sensing, energy metabolism, and oxidative stress responses affect the pathogenesis of nonmalignant kidney disease. A classic systemic adaptation to hypoxia is the stimulation of red blood cell production through increased synthesis of erythropoietin (EPO). It was the interest in understanding the physiologic and molecular basis of this response that paved the way for the discovery of the PHD/HIF O2 sensing machinery. The kidney plays a key role in this response, because it is the main physiologic source of EPO in adults. Renal EPO synthesis is regulated by HIF-2, and not by HIF-1, as evidenced by several genetic and immunohistochemical studies and by mutational analysis of patients with congenital erythrocytosis.15 EPO-producing cells in the kidney are peritubular interstitial fibroblasts derived from neuronal lineages.16,17 The activity of HIF-2 in renal EPO-producing cells (REPCs) is controlled by PHD2. This is in contrast to nonrenal EPO-producing cell types; a role for PHD1 and PHD3 in REPC-based EPO synthesis is not apparent from genetic studies in mice.15 EPO transcription is highly oxygen responsive and represents one of the most sensitive hypoxia responses in the kidney. One may speculate that this response, which increases O2 carrying capacity, evolved in the kidney specifically because of its limited ability to augment O2 delivery through other regulatory mechanisms, such as increasing RBF. The mitochondrial respiratory chain uses O2 to generate ATP, which fuels multiple cellular processes and is consumed mainly by Na-K-ATPase to transport solutes. Efficient metabolic adaptation to low pO2 is therefore imperative for the maintenance of renal transport functions and ultimately the promotion of cell survival. The PHD/HIF pathway has a central role in metabolic reprogramming under low pO2, because it regulates cellular energy and glucose metabolism at multiple levels. HIF shifts metabolism from oxidative phosphorylation to anaerobic glycolysis and suppresses mitochondrial respiration and ROS generation. It does this by increasing the expression of glycolytic enzymes, such as hexokinase, phosphofructokinase, aldolase, phosphoglycerate kinase 1, enolase, and lactate dehydrogenase, by blocking the conversion of pyruvate to acetyl CoA through transcriptional upregulation of pyruvate dehydrogenase kinase, and by regulating the expression of proteins that compose the mitochondrial respiratory chain.19,20 Because lactate production increases when glycolytic flux increases, HIF is also involved in the prevention of cellular acidification by regulating the expression of sodium/hydrogen exchanger -1 and monocarboxylic acid transporter-4, thus facilitating the excretion of protons and lactate.21 Moreover, HIF-1 activation in tumor cells keeps intracellular pH in a slightly alkaline range by increasing membrane-bound ectoenzyme carbonic anhydrase IX expression, which catalyzes the conversion of CO2 to bicarbonate.21 This effect of HIF activation may also be of relevance for renal adaptation to hypoxia. In the noncancerous kidney, HIF-α stabilization is found in both acute and chronic kidney diseases.23 In patients with diabetic nephropathy, for example, the degree of HIF activation correlates with severity of renal injury.24 HIF activation in the setting of CKD is due to chronic hypoxia or can result from oxygen-independent PHD inhibition.23 The causes of hypoxia in CKD are multifactorial and involve structural and functional changes that are commonly associated with fibrotic kidneys. These include abnormal renal perfusion from capillary rarefaction, glomerular injury, atherosclerosis, and altered vascular tone, as well as anemia and impaired O2 diffusion due to fibrosis.25 Increased V̇o2 has been described in diabetic nephropathy and decreases renal pO2. This is partly due to mitochondrial dysfunction.26 Due to the unique features of renal O2 regulation, pO2 in the kidney is very sensitive to changes in intracellular O2 consumption caused by inefficient mitochondrial O2 utilization, as increased RBF, which raises GFR, is unlikely to compensate for increased O2 demand. While it has been suggested that HIF promotes progression of CKD by increasing the expression of profibrotic factors and by facilitating epithelial dedifferentiation,24 the mechanisms underlying renoprotection are likely to involve multiple signaling pathways and metabolic changes, which include HIF-induced expression of cytoprotective genes; reprogramming of glucose, energy, and adenosine metabolism; beneficial effects on mitochondrial O2 utilization, renal V̇o2, and mitochondrial ROS production; enhanced ROS scavenging; suppression of renal inflammation; and maintenance of vascular health and integrity (Figure 1).23,27,29,30 Given that the regulation of the PHD/HIF axis and its downstream targets is cell type dependent and involves multiple feedback loops including changes in the epigenome, it is likely that the mechanisms of HIF-mediated cytoprotection differ between acute and chronic hypoxic conditions.12 This certainly poses a major challenge for the identification and validation of relevant molecular targets and cell types that mediate HIF-induced renoprotection. 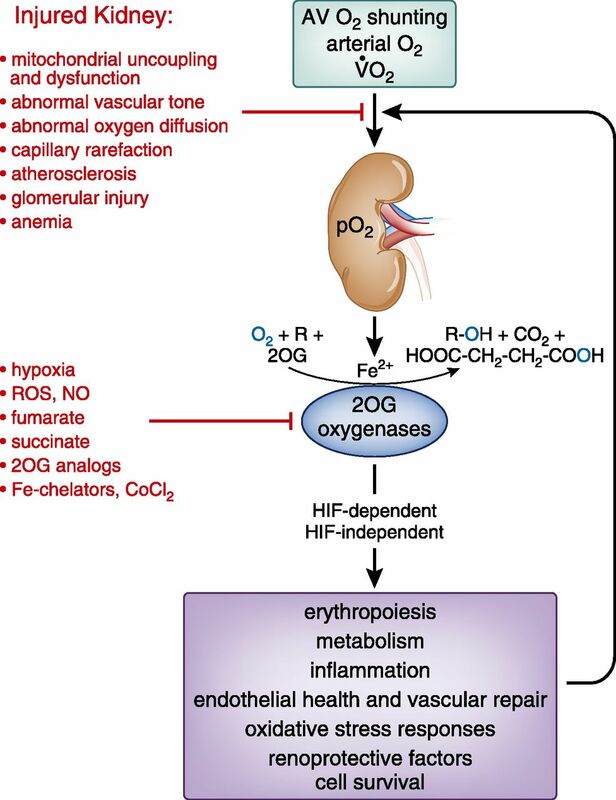 In this review of renal hypoxia responses, I focused on selected aspects of molecular O2 sensing in the kidney and discussed its potential for therapeutic exploitation. Since the discovery of the PHD/HIF pathway, many new questions have emerged. Although the activity of renal HIF is controlled by specific HIF 2OG oxygenases, the significance of their reaction with non-HIF targets and the role of other non-HIF 2OG oxygenases in renal physiology and pathophysiology are still unknown. Fascinating are the therapeutic opportunities that the PHD/HIF pathway provides. Knowledge of the effects of pharmacologic HIF activation on human physiology and pathophysiology, however, is still limited. Controlled physiologic studies in humans, in concert with studies of patients that live at high altitude, are likely to advance our understanding of HIF responses in the kidney. This, together with animal and in vitro investigations, will hopefully lead to the development of new therapies that improve the life of patients with kidney diseases. Because of journal guidelines and the nature of this focused review, the author apologizes to all of those colleagues whose work could not be cited. V.H.H. is supported by the Krick-Brooks Chair in Nephrology, and by research grants from the National Institute of Diabetes and Digestive and Kidney Diseases.